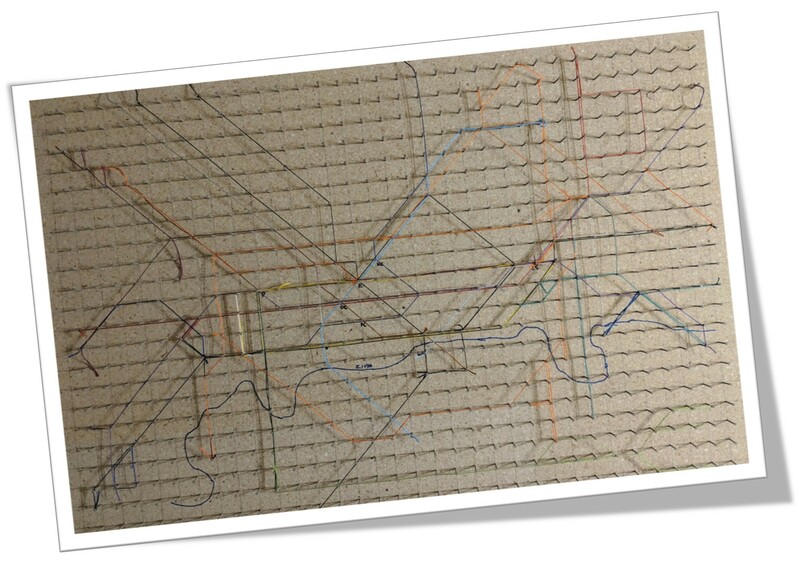 Last week I went to a schematic mapping workshop in Vienna, Austria. 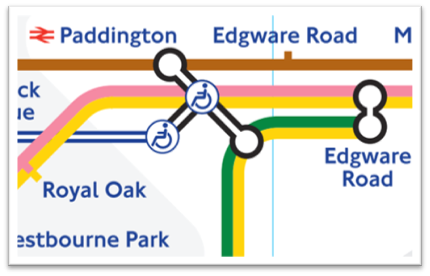 Schematic maps are some of my favourites and I'd used this opportunity to finally get round to developing my own ideas about a redesign of the London Tube Map. I'm by no means the first and won't be the last but after penning a discussion of what I characterised as the over-use, mis-use and abuse of Beck's original style from 1933 (The Cartographic Journal, 51, 4 pp343-359) it really was about time I put my money where my mouth was and had a go. The workshop provided a hard deadline and an impetus to make a map and throw it to the lions. There were about 40 or so people attend the workshop. 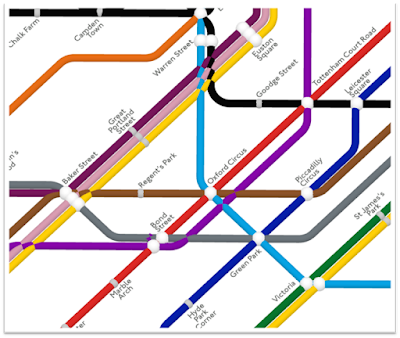 People came from a wide array of academic backgrounds - psychologists, computer scientists, graphic designers, cartographers and the transport industry itself. I'll be blunt. It was disappointing. While there were some interesting talks there was very little true sharing of ideas or development of collaborative opportunities. The cliques stayed within their own cliques and so the opportunity was lost. I displayed my maps and not one person wanted to actively engage in a discussion, or offer ideas for improvements. Having paid for the trip out of my own pocket that's disappointing. So what we ended up with was another example of academic parochialism at its worst. Niche groups striving headlong up their own small part of a much wider discourse and not really willing to engage beyond what they know or do. There were lots of words but not much else. 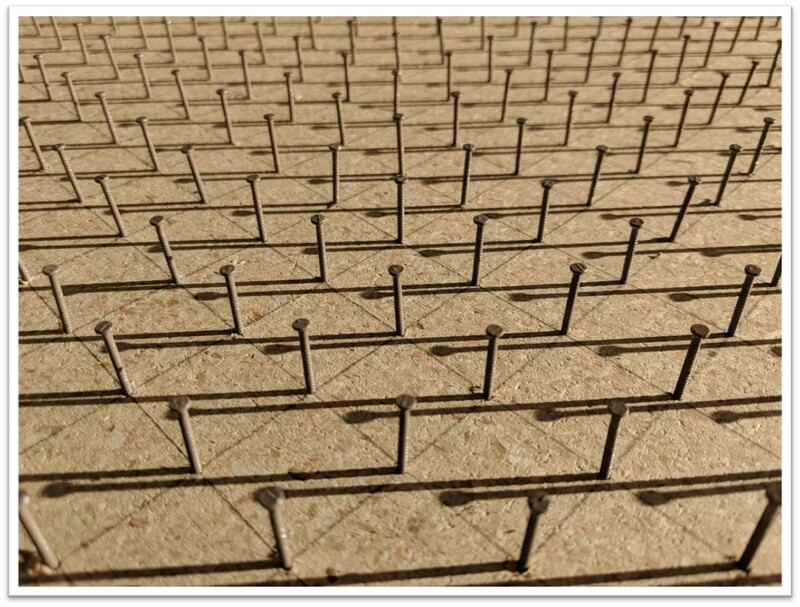 We had people focusing on usability, but not really appreciating practical implementation. We had people searching for efficient algorithms for label placement or line arrangement, not appreciating that many software packages already exist to do much of that heavy lifting. We had the idea that a fully automated map is difficult to create but never a real discussion about why you'd want that anyway. After all, maps are always made by humans to a greater or lesser extent. We had the idea that many who make schematic maps do so with design software. 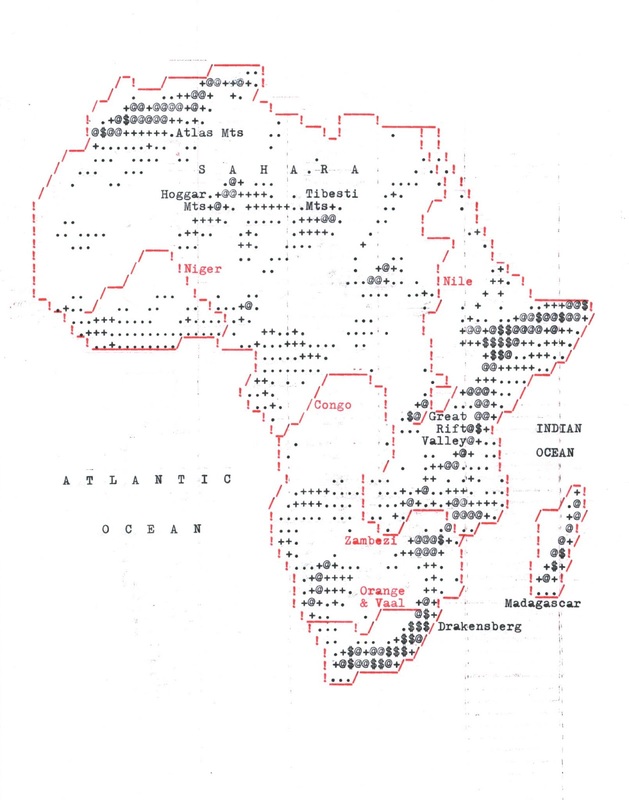 There was little from the GIS or data-driven cartographic community and no real appreciation of its existence or value. A lot of it was searching for a solution to a problem that isn't properly defined. It's low-level academic effort. The sort that keeps people busy but doesn't ever actually get anywhere purposeful. I know. I used to live in that world, and the further I get from it the more I recognise it for what it is and the more I am relieved to be out of it. And the classic examples of 'research results' based on a survey of a group of students who are easy to cajole into research always has me raising my eyebrows. At best it's lazy, at worst, it undermines your work beyond it being useful. 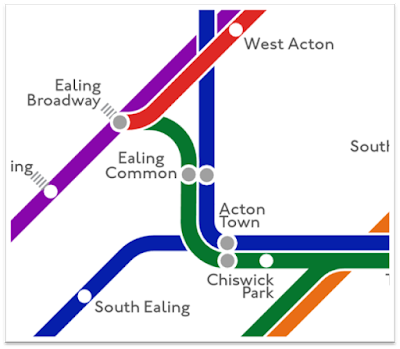 Of course students are likely to also be public transport users but they are not a diverse enough set of people if you want to capture the wide variety of people who have many and varied needs. I think we can do better. But there was also something else that made me think about the event in a way that I cannot ever recall feeling before. I guess what I found most disconcerting is I felt like an outsider. This is a group founded and moulded by Maxwell Roberts who describes himself as "the world’s leading specialist in schematic map design". So, inevitably, there's going to be some disciples of his work in attendance and, as it turns out, all but 4 talks were 'invited'. Dr Roberts even took the floor twice for two 35 minute stints to bookend the event. Except I'm not one of his disciples. I like much of his work but ever since I wrote that journal article, Dr Roberts has made it known he took exception to my characterisation of some of his work as being unhelpful to wider debates about the value of Beck's work. To me, there's value in debate. Just because person A says something, person B does not have to agree. I used the opportunity to write a refereed paper that expressed my views based on the evidence I presented. In normal academic discourse, such views can and should be challenged. Different views expressed and published and so forth. But, it seems, this is not the case and it was unfortunate that Dr Roberts went out of his way to avoid me in Vienna. It's unfortunate but I can live with that. Should I have approached him? Possibly. But when you get bad vibes you tend not to bother in the interests of self-preservation. 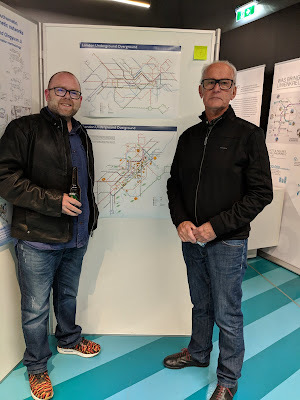 Map Gallery at the Vienna Transport Museum. There was a gallery of work on display at the Vienna transport museum on one evening. 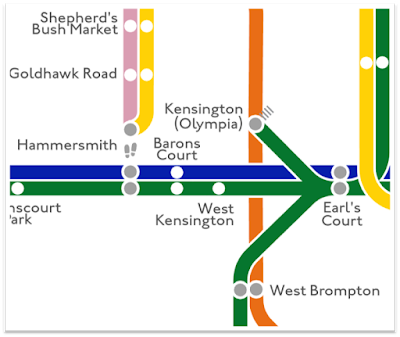 My maps were up there and earlier in the day I'd expressed my wish that people tackle them, rip them apart and let me know what they thought. I even wore my London Underground District Line Moquette shoes for some added interest. Maybe Dr Roberts would take the opportunity? Unfortunately not. Again, he went out of his way to avoid me (and my colleague Professor William Cartwright too). Professor William Cartright and I at the map gallery. So let's get this straight. Dr Roberts had every opportunity to talk to me last week. He had every opportunity to discuss my previous paper as well as my effort at making a map of the London Underground. But no. Instead, he posts a bitchy tweet (without using my twitter handle). It's a shame he didn't say my font was too small to me in Vienna because I totally agree with him. In fact, the prints were the first time I'd seen the work printed and my first reaction was the same - fonts are way too small. WAY too small. And this is the point of critique - to put your work in the gaze of your peers and others and to take on board comments and criticisms. A future iteration will address this limitation. I wasn't going to write about my experience in Vienna but his tweet has me annoyed simply because he could have spoken to me in person. I should have seen the signs. Last talk on day one. My colleague, Professor Cartwright given less time than the other speakers. It all added up to support the fact that we simply were not wanted at the workshop because 5 years ago we had the audacity, the sheer temerity to offer some critical thoughts on some of his work as part of a wider debate. Yet they took our registration fee quite happily to boost numbers. If you're going to marginalise people then do so with class. But it doesn't achieve much. It narrows your potential for considered debate, albeit some of which might be challenging, but which ultimately strengthens a discipline. I don't like some of his work so therefore he doesn't like me. Makes sense eh? Not to me it doesn't. Tweets are cheap. I know, I send enough of them! 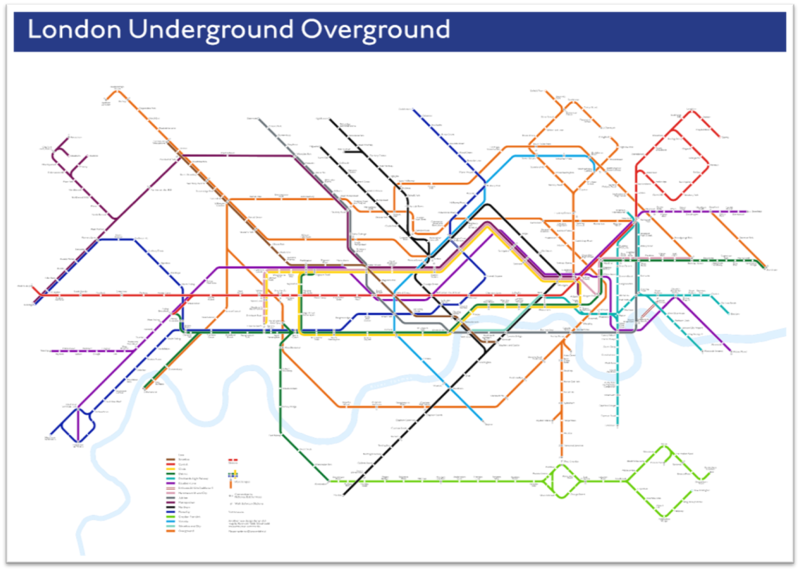 But having had the opportunity to tackle me about the 2014 paper, or even chide me for my amateurish effort at tackling a really tricky map he, instead, waited until there was no danger of discussion. Ahh well. What I did find of immense value at the workshop was listening to a presentation by the train manufacturer Siemens along with those at Wiener Linien who are exploring their cartography in relation to real needs, namely to fashion maps for a new generation of trains. So they are getting on with the job. We weren't allowed to take photos and I should probably not say too much as the work is currently not public and remains confidential. Except to say, they are experimenting with some really innovative animated maps. 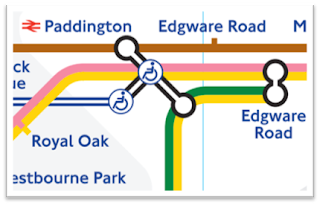 These go well beyond having a simple animated symbol that shows where you are on the route. There's morphing of the map under particular circumstances, changes to content depending on location and conditions, focusing of detail to serve the needs along the route, and real-time information delivery that goes way beyond simply showing train times and connections. I've honestly not seen anything like it and had a wonderful chat with the people behind it. These are the conversations you enjoy and ones which take you forward. The small-mindedness of a few has not detracted from my experience of this particular work and the potential it offers. This, to me, also shows where we are in terms of who is driving research these days. Industry has overtaken academia in many fields. Cartography is one such field. 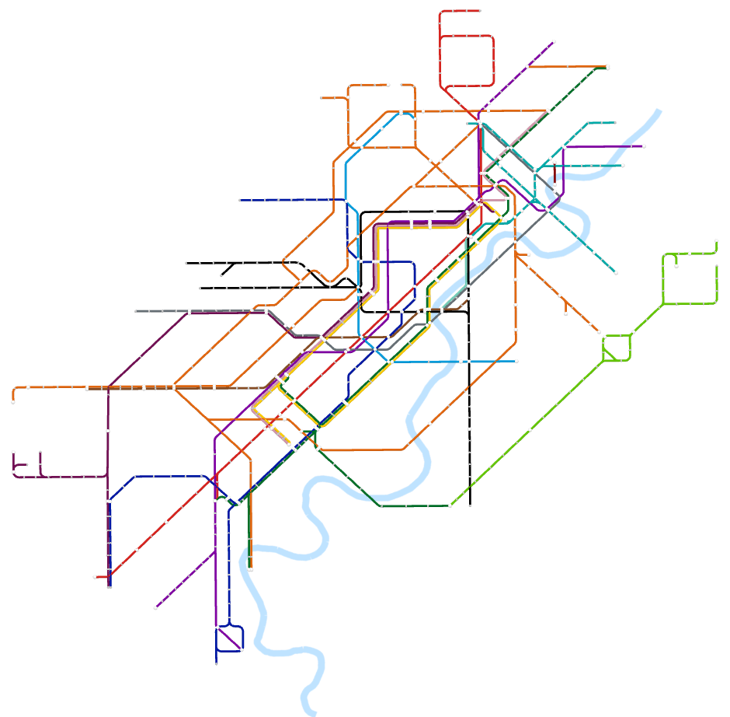 Small groups of people doing very niche academic research into aspects of map design are becoming unimportant. And I think that's why these sort of workshops become increasingly frustrating. They aren't really helping move things forward, certainly not with much pace. There's too much reinvention and no real cohesion. They seem to exist to further one or two people's aspirations for relevance, rather than a sustained research agenda that feeds into real implementation. And along comes a train operator who, along with their customers, defines a need, researches it, and develops a solution. I expressed this view earlier in the day at an 'open mic' slot where I used 10 minutes to play devil's advocate. In 2005 Google both decimated and utterly reinvented cartography. 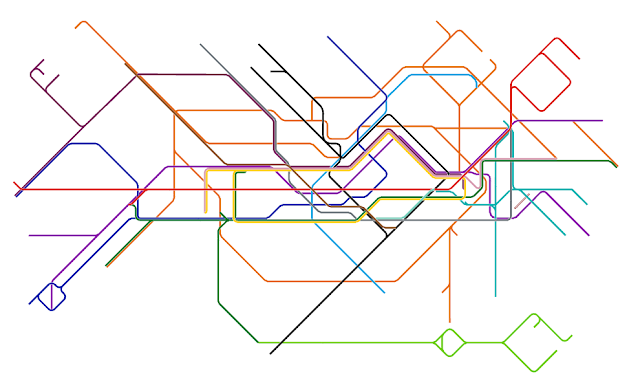 Since then, most transport networks persist with their schematic maps yet I contend that people are more interested in travelling between places of interest, not station names. 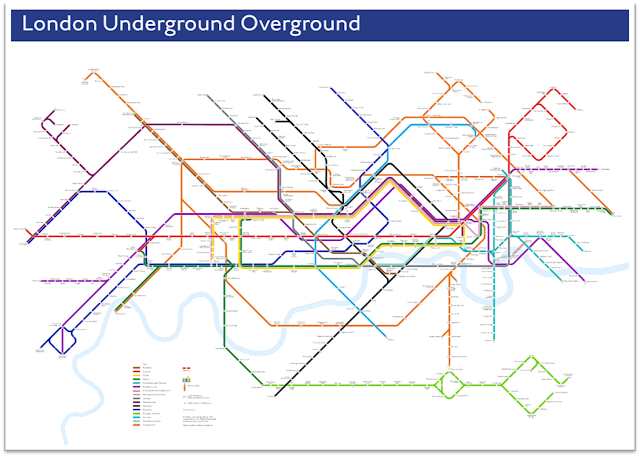 Of course, this goes against Harry Beck's principles that above-ground geography is unimportant to the traveller but I think times have changed. 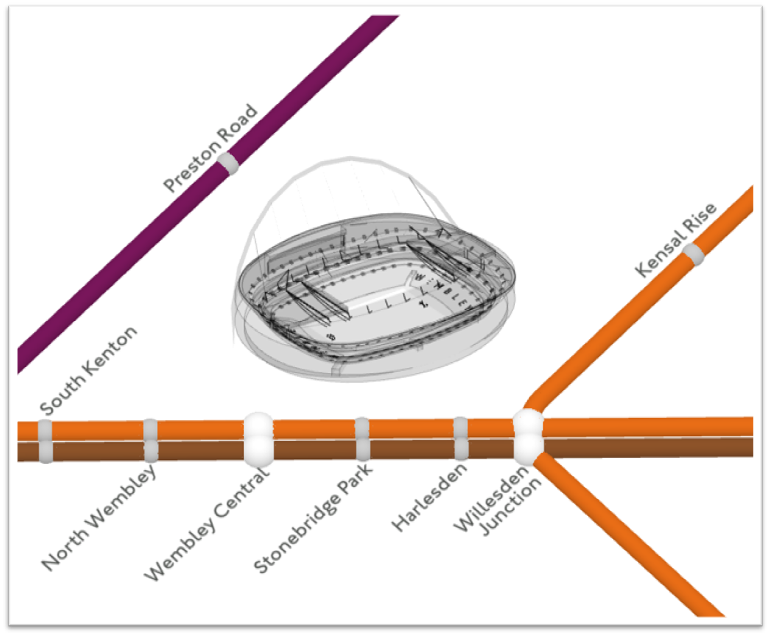 So, for instance, if I'm in London and I want to travel between the London Eye and Selfridges how do I work out my route? I open Google Maps and I type in directions. I would suggest most people will likely do the same. 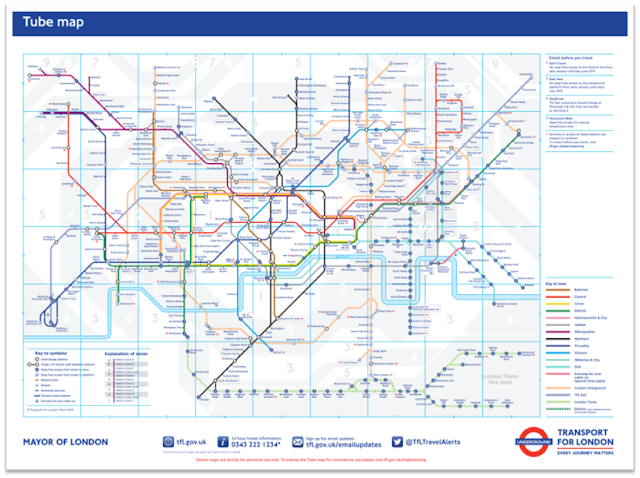 In fact, I cannot recall the last time I actually saw someone use a pocket London Underground map. And even if I did I have to know where the two points of interest are in the first place and relate them to the location of stations. That's often very difficult with a schematic map. 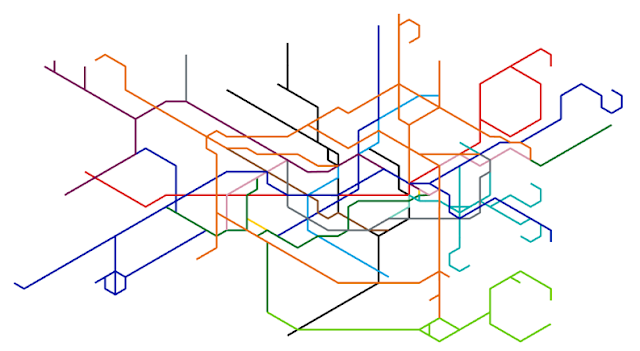 And yet Google Maps returns the optimal route (walk to Westminster station and catch the Jubilee line to Bond street). 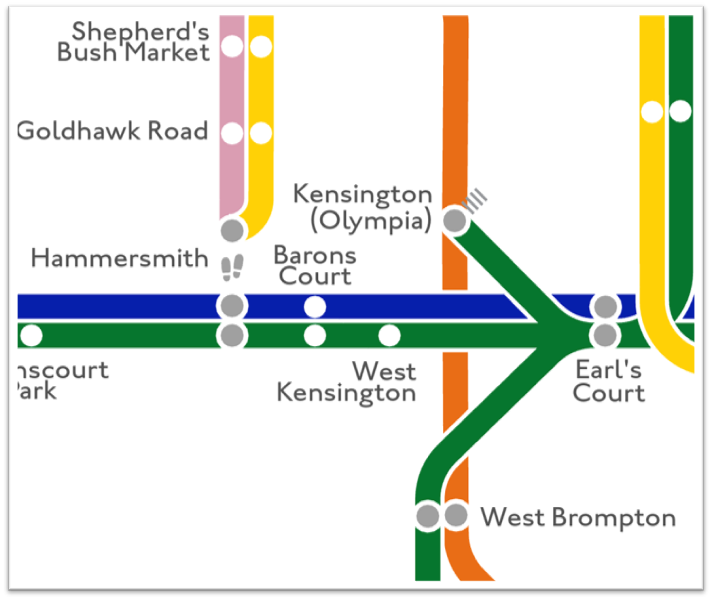 It gives me real-time train arrivals, journey time, walking routes to bookend the tube journey, as well as bus alternatives, and it now even tells me that a Lime scooter is nearby and could be quicker. 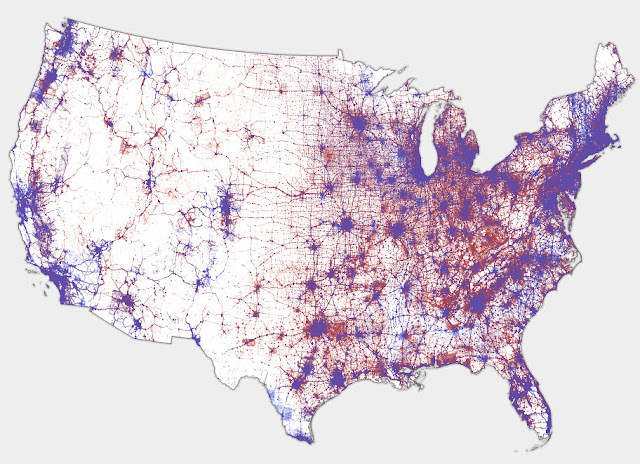 The map zooms to become hyper-local. We see the actual location of station entrances so we can relate our geographical surroundings to where we actually need to go. 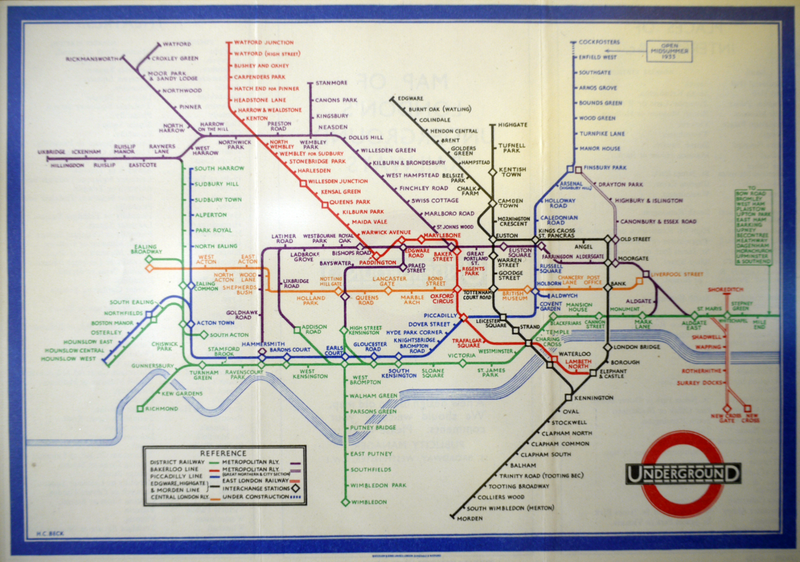 And the map has the geographical tube network overprinted. So, my assertion is that, in 2019 the schematic map as we know it and love it may be dead. People use their smartphones and Google Maps to do their journey planning. It may well be the case that the printed schematic map has been killed by Google. Maybe this is what upset Dr Roberts? I don't know. I don't particularly care. Unfortunately, in retrospect, the workshop was simply about his self-promoting academic parochialism. I'm glad I'm out of it, and Max, if you're reading this, please be assured I'll not darken your door at the next workshop. But I will be buying your next book on airline schematic maps because I'll likely very much enjoy it. 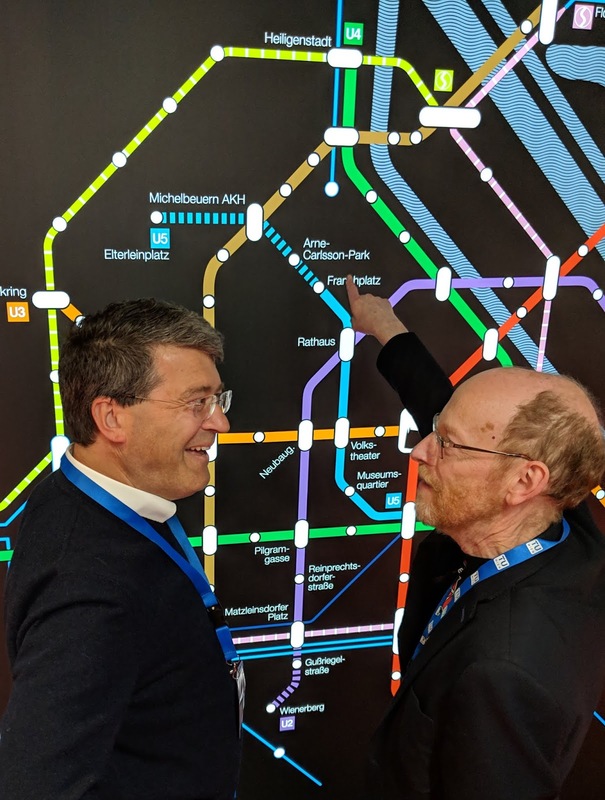 Professor Georg Gartner and Dr David Fairbairn discuss the Vienna map. Unfortunately, Dr Roberts has decided to double down on his twitter rant. Seems a little unfounded to me but I made the point that the opportunity to discuss, debate, argue even, was last week. Why didn't he take the opportunity to have me on a panel discussion for instance? Or even have a quiet word with me during one of the breakout sessions? It's not unusual for people who are passionate and knowledgeable about a subject to sometimes disagree but the art of academic discourse is to attempt to appreciate other people's perspectives. If you are closed to that, and wrap it in unsubstantiated personal attacks then you are doing yourself a disservice. I am concerned for his students if this is how he fosters discussion and engages in debate. It also reflects poorly on the University of Essex if this sort of approach to academic discourse is in any way supported. Just some things that piqued my interest this year, in no particular order. And please do go to the links to see larger and higher-res versions posted by the authors. 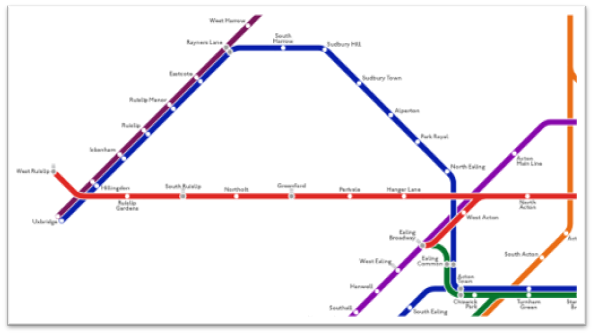 Evolution of China's subway system by Peter Dovak. So technically this was from 2017 but I didn't see it until 2018 so I'm giving it a bump here. 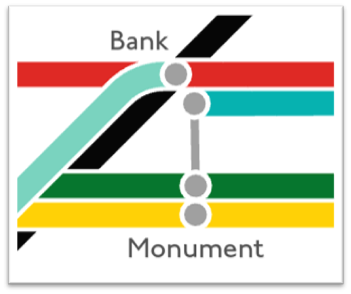 I love the mini-subway maps on their own but the animation works well too. In a world where the scientific community invariably defaults to rainbow colour schemes for any map that shows climate or weather, this is a soothing sight for the eyes. 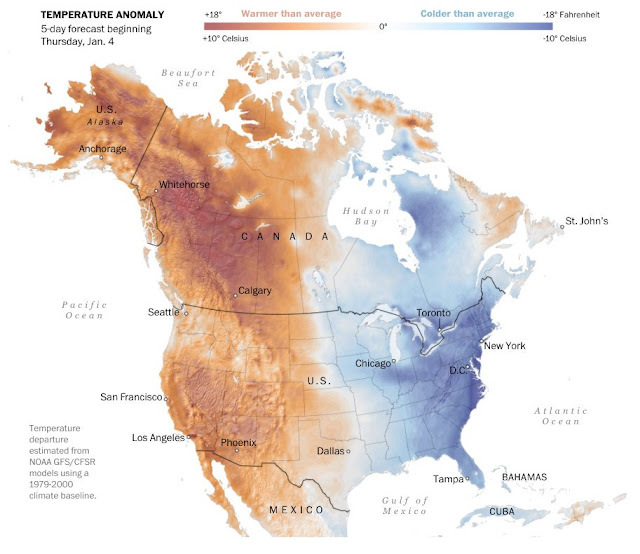 Proving that maps do not need to be overly complex, this is a cracking map by the talented Washington Post graphics team. 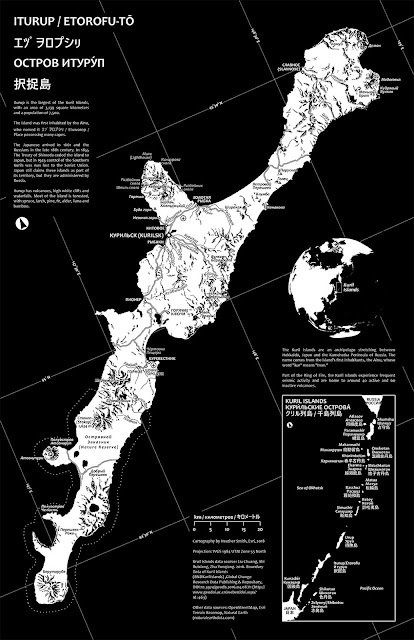 Mixing digital techniques with some old school hand drawn terrain gives this map a wonderful aesthetic, not to mention that white on black is both stunning and difficult to do well. Many people are shying away from digital and experimenting with more human mechanisms for map creation. Here, Daniel gets out his father's old typewriter and does some experimenting. I just like it. There's a few different examples on his blog, linked above. This is just a beautiful map. mike's taken design cues from a number of historic styles and blended them into this composition to perfection. I could write paragraphs about the colour, typography, cityscapes, cartouche etc. 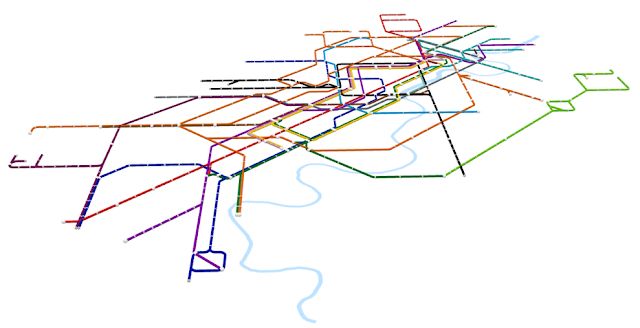 but, the whole piece is cartographic elegance personified. It's not every day that a new map projection gets people excited but this year we had such a day. 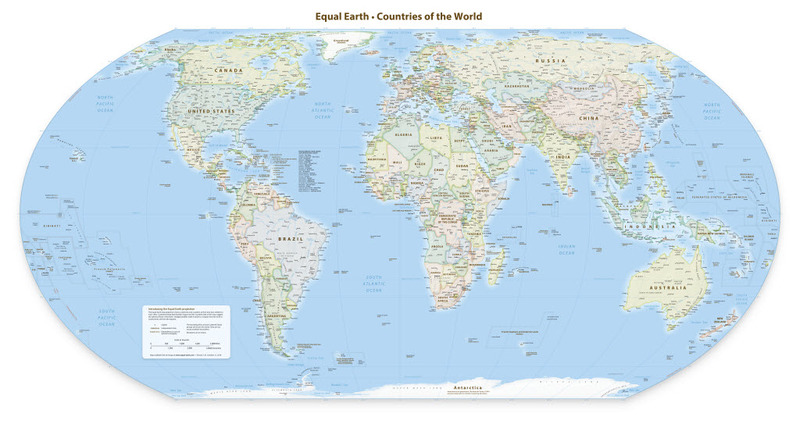 A new projection showing the land masses at true sizes relative to one another. An antidote to that bloody Mercator thing, and far more useful as a wall map. 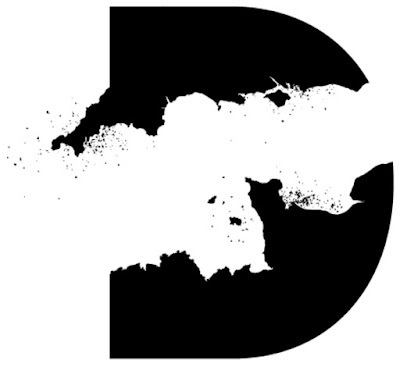 Combining the map of the south coast of England and the north west coast of France, broken by the English Channel, with the letter D makes this a fantastic, if not poignant, expression of the focus of this museum. You don't need a new atlas but you can certainly want one and this would be it. The 'greatest book on earth' gets a facelift as well as the many content updates. Beautiful cover, but I always like the giant bookmark because it doubles as a legend for all the maps, and there are 320 pages of them. Cartographic consistency and coverage at its finest. Authoritative? Of course. 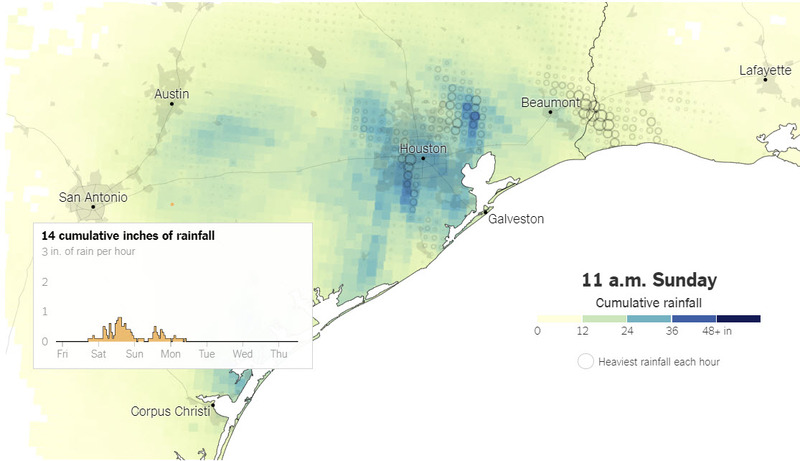 A feast of animated and static maps tell the story of this destructive hurricane. i particularly liked the lead map that showed the rainfall intensity by hour as proportional circles, with cumulative rainfall denoted by colour. Again, no rainbows! And as you hover over the map you get a graph of the rainfall across the week for wherever you hover (go to the animated version using the link above). Superb. Wonderfully creative metaphor - the use of tree rings (each ring being 10 years) to show the pattern of immigration from different parts of the world compared to natural-born. And I am a sucker for a Dorling cartogram. Normally, I'm not a fan of spiky digital globes but this tends to the artistic rather than analytic so it works. 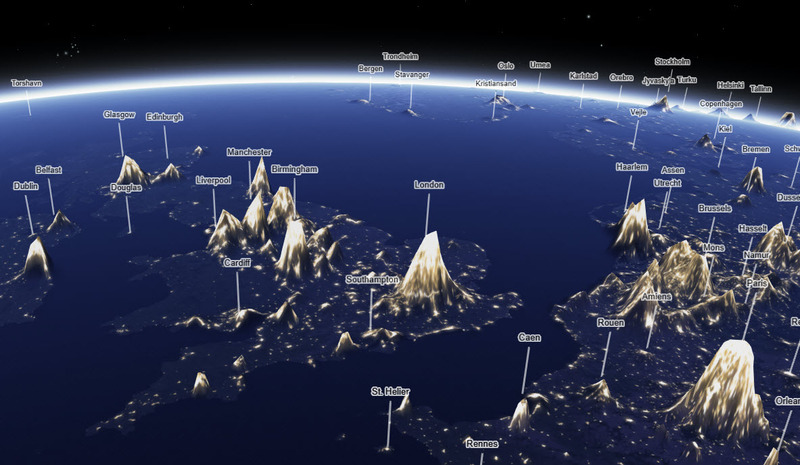 Height of the globe's surface modified by luminance from nighttime light. This is insane. 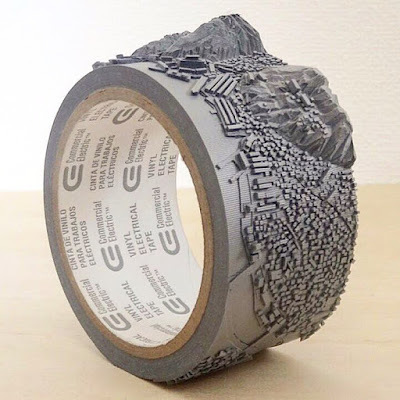 It's a miniature sculpture cut into the tape. Who needs 3D printers! 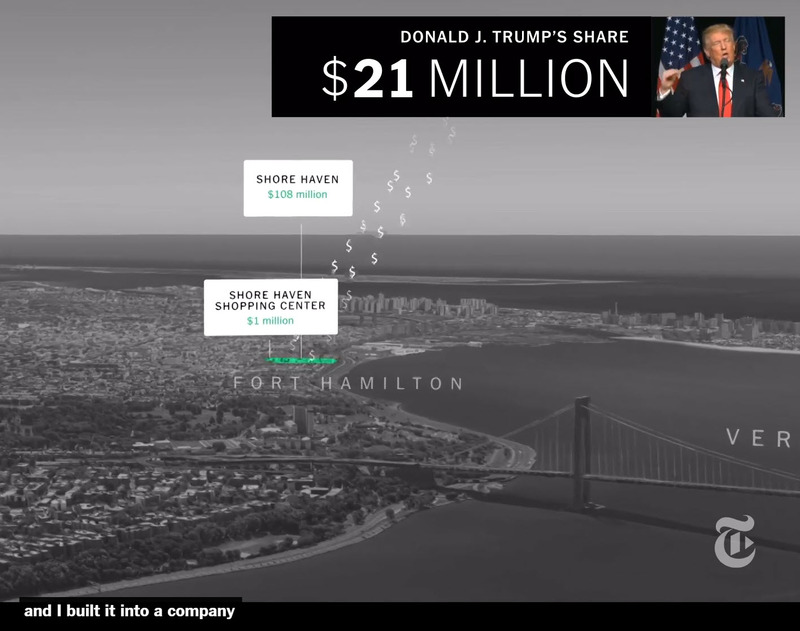 'A tiny, little, beautiful company' is a great piece of cinematic cartography embedded in this article on Trump's proclamations about his finances. 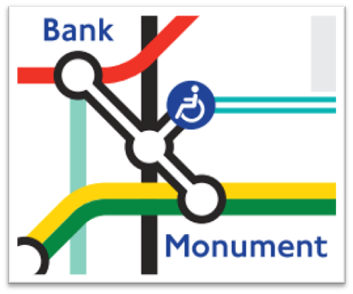 Uses a monochrome grey palette for the map, punctuated by splashes of colour for notable buildings and assets, all accompanied by a soundtrack of Trump statements by the man himself and a cumulative total of his alleged worth. 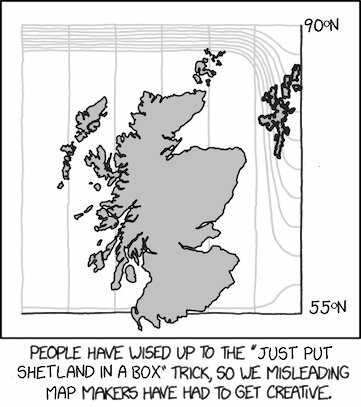 The year was marked by a right kerfuffle over the nonsense proclamation that The Shetland Isles should no longer be placed in an inset box. This provoked much humour and cartographic satire. Alan nailed it with this xkcd inspired solution. A terrific cartoon styled map commenting on the shift in balance in the NBA as LeBron James moves to the LA Lakers. 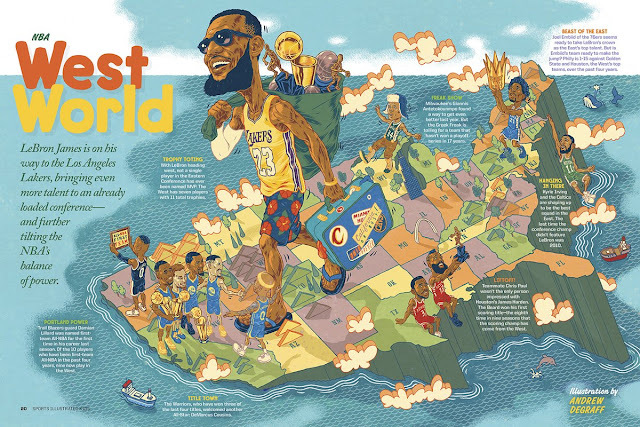 Perfect for the kids edition of Sports Illustrated but adults can appreciate the cartographic worth too. Anyone and everyone interested in thematic mapping should bookmark Zeit Online. 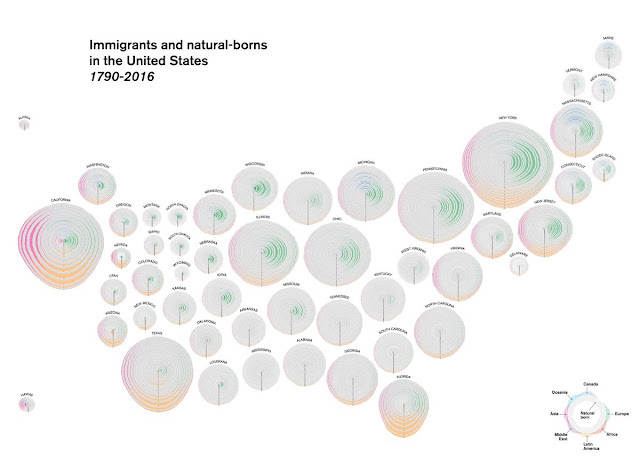 they consistently set the bar for great cartography of a diverse and rich spread of data. 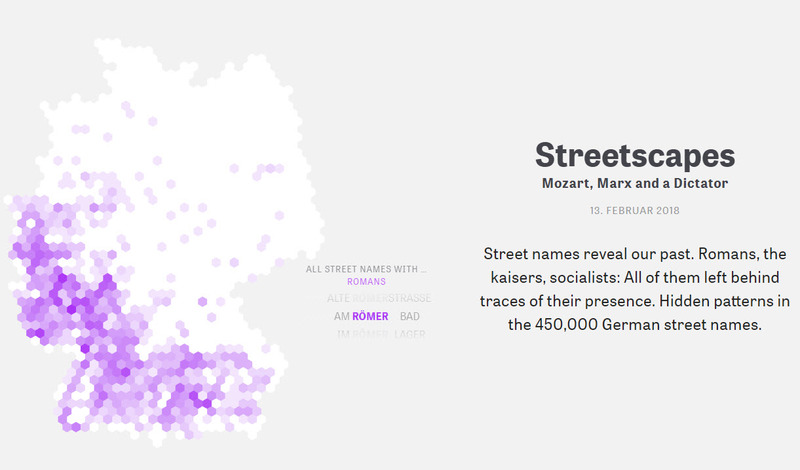 Here, an analysis of German street names reveals the legacy of times past and the impact of composers to dictators. Great example of marrying maps with scrollytelling too and proof that the hex-bin is alive and well. A hat-trick of favourite maps for NYT this year. 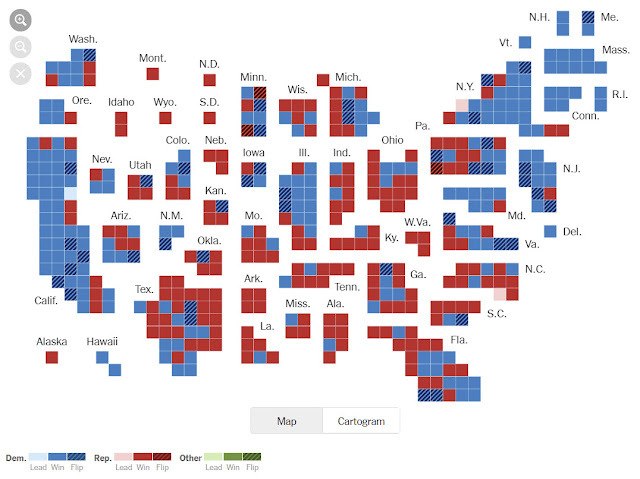 Also, a great twist on the cartogram with white space used very effectively to create a non-contiguous version of the map of House Seats. There's also a geographic version if you prefer, a good trend to offer both which many news organisations are going with. And, of course, if you hover over each square you get the results (go to the link above). High quality interactive cartography. 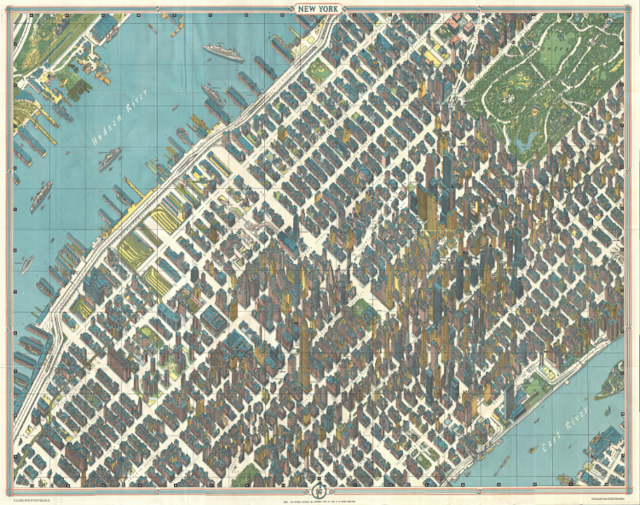 Not a map, but a book of maps and terrific stories. Definitely in my top one of these coffee-table style books of maps. And if I may beg your indulgence, I don't normally include my own work in my end of year favourite's list but I'm kind of proud of a few projects from this year so I'm just going to put them here for your enjoyment...or you can stop reading now. You've had fair warning. Together with my colleagues Edie Punt, John Nelson, Wes Jones, Nathan Shephard and an army of people behind the scenes it's been amazing to deliver a Massive Open Online Course to over 80,000 people this year. Who would have thought there were that many people interested in learning about making maps! And here's a map of a good portion of those students, who come from all over the globe. 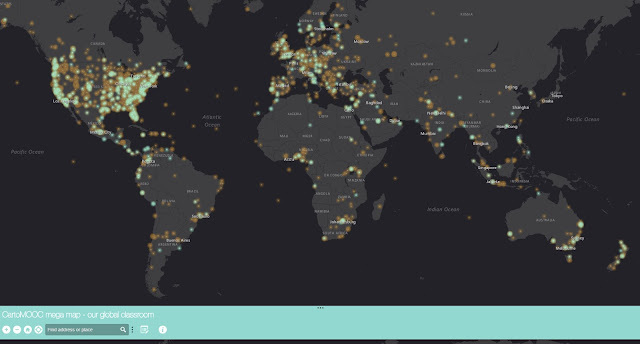 I think it's the best map of a large online class of cartographers this year. I made a map, from wood, and used as a cheese board. 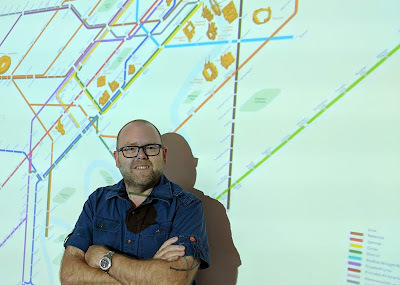 Accompanied a Geomob event in London in September and is the cover map for the 2019 GeoHipster calendar. 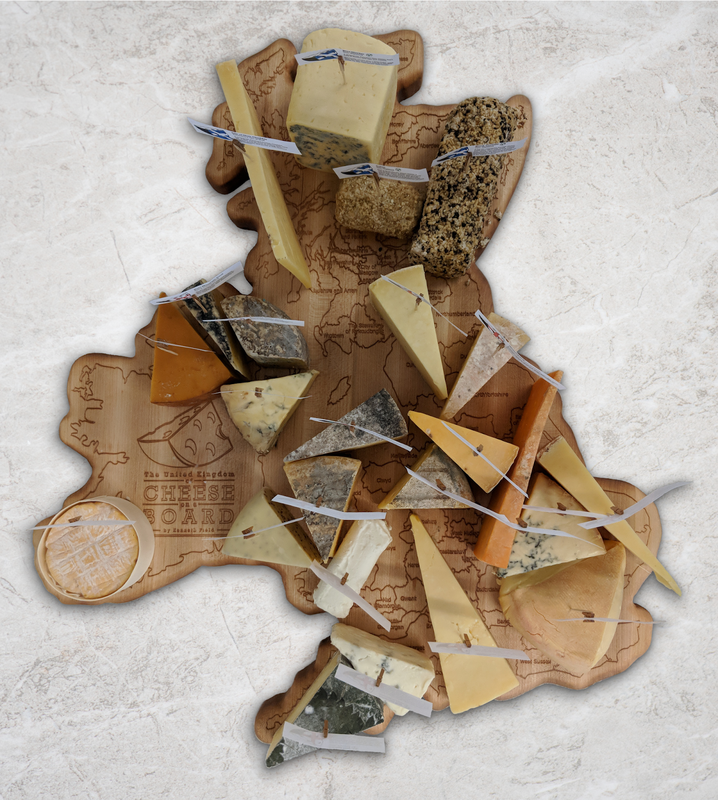 I think it's the best map of cheese this year. 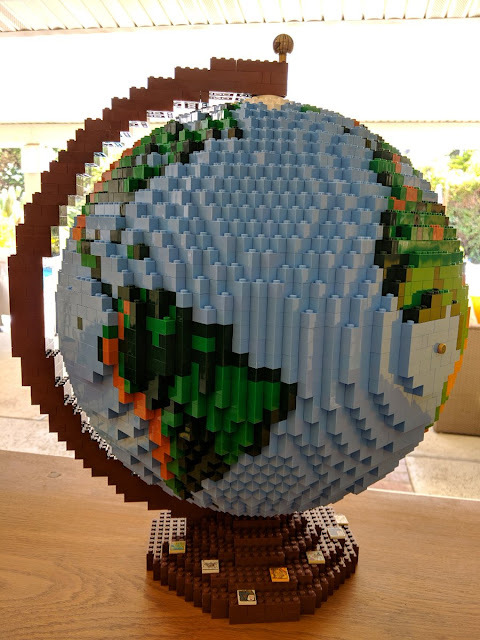 Based on a design by Dirk I built my very own Lego globe. Because...Lego AND maps. I think it's the best Lego globe this year. A technical challenge but a 1 dot to 1 vote election map that became my 15 minutes of viral fame in 2018. I wrote a book that was published this year...I know, I've been quite quiet about it. I'm bloody well proud of it and immensely grateful for my talented colleagues and the company I work for, for giving me the space, scope, help and freedom to write it. 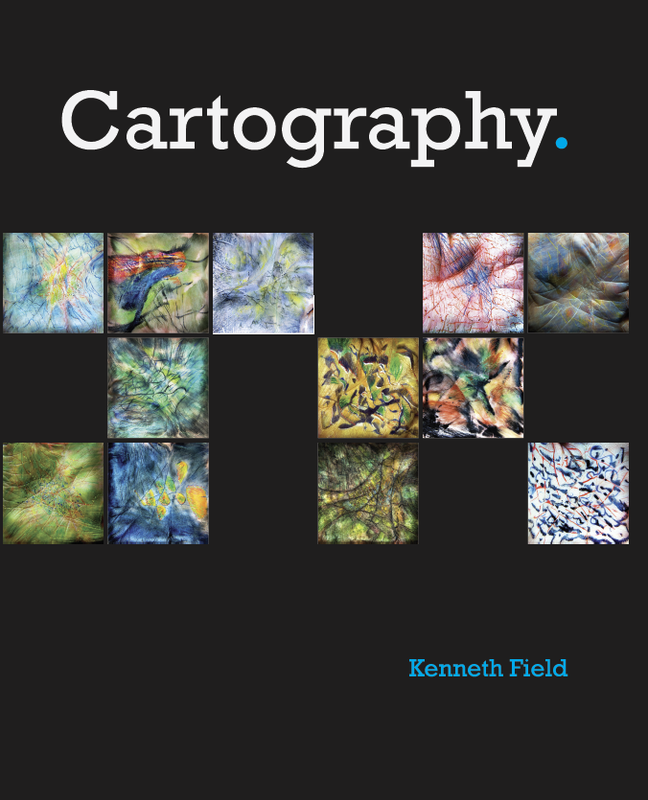 I think it's the best book on Cartography this year. 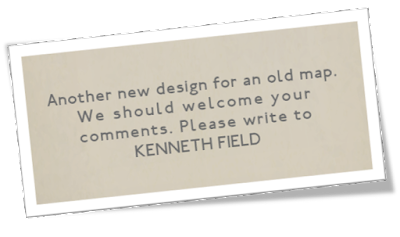 OK - so my entries are a little cheeky but I hope you found them of passing interest in the list of your own maps and map-related products of 2018. Here's to a mappy 2019! So many large format coffee-table map books are written by map experts, map librarians or map historians. 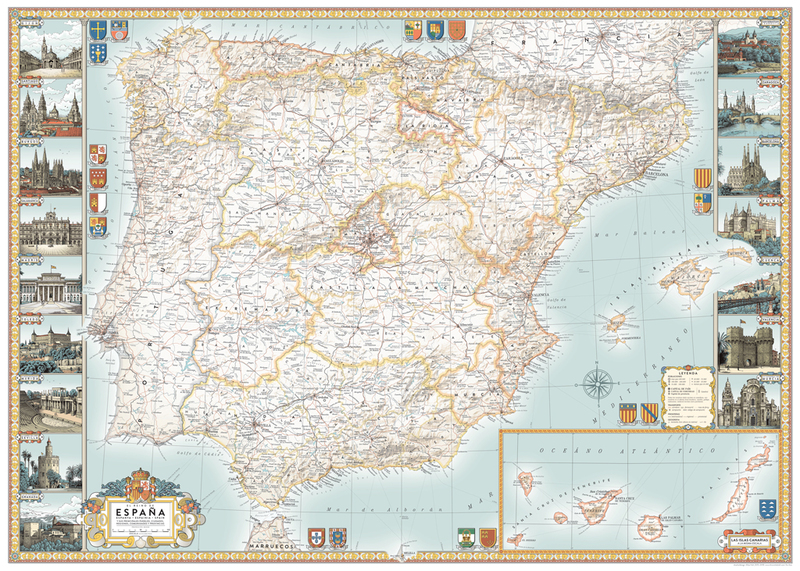 They carefully select the maps based on a criteria that generally relates to some cartographic measure of their worth. 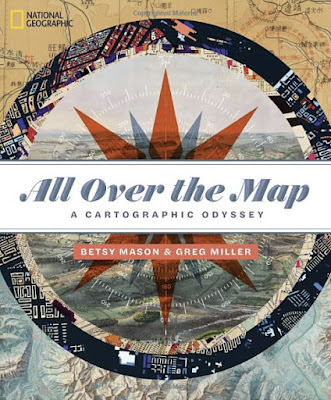 Betsy Mason and Greg Miller are not cartographic experts, well, at least not by training, though they are fast demonstrating a deep understanding of what makes great maps tick. Mason and Miller are journalists, award-winning journalists in fact. More specifically they have a background in science (earth science, geology, biological, behavioural, social and neurological science! ), and the reporting of science in some of the most august publications and came to cartography via their excellent blog from Wired which they launched in 2013. They now co-author the blog All Over the Map at National Geographic. Is this background on the authors at all relevant? Yes, because what they bring to their interest in cartography is a fresh perspective. They aren’t burdened by having a list of maps that have to go in their collection (you know the ones…we all know them). They have chosen what they want to go in, and so their list is, in the main, a fresh list and contains many maps you’re unlikely to have seen. Of course, there’s some absolute classics such as Mount Everest (1988), published by National Geographic. It appears early on but it’s a book published by National Geographic and they would be remiss not to include such stunning work. But the book goes far beyond the vaults of National Geographic and presents well-known maps side-by-side with lesser known examples. I’m pretty sure even if they had a classic map in mind it’d not make the cut if they couldn’t find something interesting and fresh to say about it. The book is broadly divided into nine sections that group the maps by theme: waterways; cities; conflict and crisis; landscapes; economies; science; human experiences; worlds; and art and imagination. Think of any map and you can probably position it in one of these broad topics and it gives the book a pleasing structure. It makes it non-linear and that allows a certain element of randomness when you turn the page. Within each section we see both historical examples and contemporary maps. 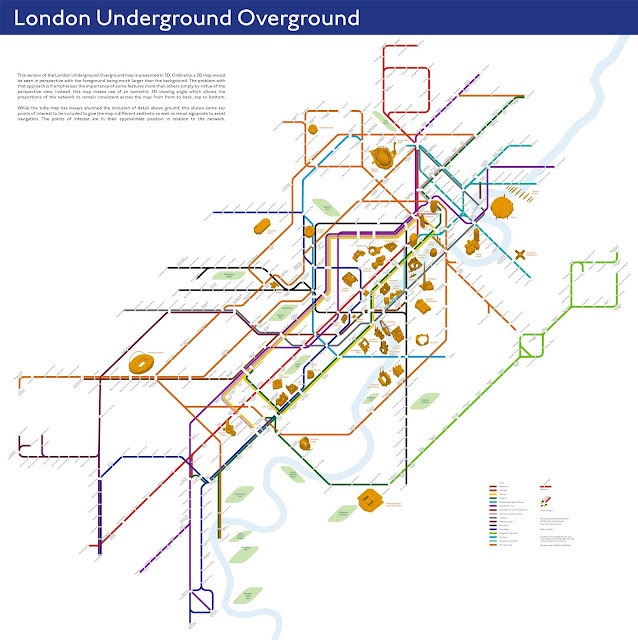 Maps made by government, commercial companies and also individuals just experimenting with some data. I found myself actually ignoring the groups and just going page-to-page from one delightful map to another, sometimes flicking and stopping as if you were thumbing through a pack of cards and stopping randomly. Each page is different and captures the map in rich printed form but it’s the writing that elevates this from just a collection of maps and their makers. 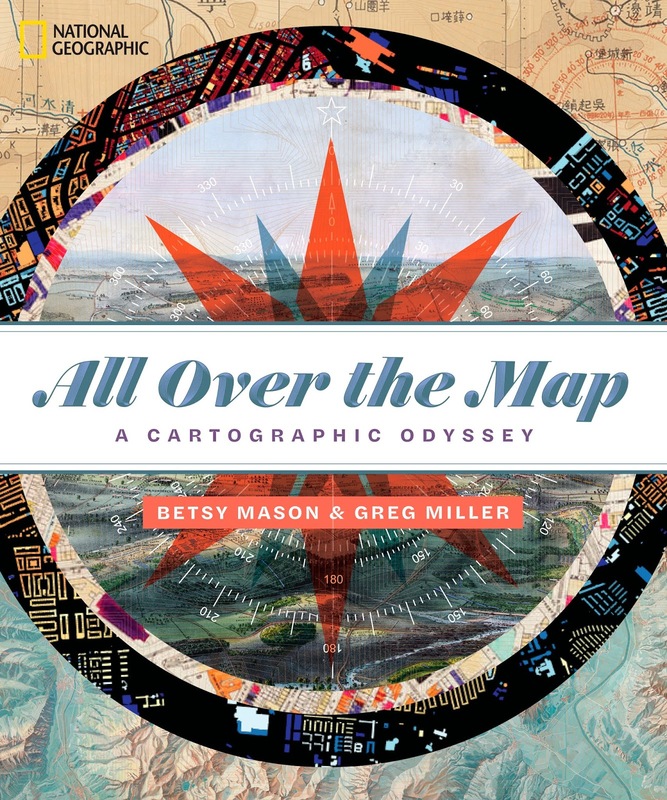 Mason and Miller dig into the personal stories of the maps, and the people who made them. They explore the contexts and environments of the maps; and often the trials and tribulations of their circumstance. They reveal far more than the map as a captivating and arresting image. They reveal the often intriguing and personal stories behind the maps. So, in this sense, the book is more of a collection about maps than it is a book of maps. The fact that the maps are beautiful makes it simply a superbly illustrated story book. 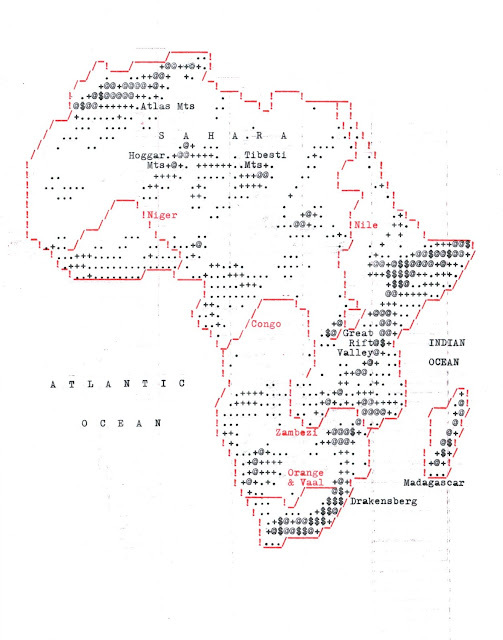 And it’s important that many of these stories are told because for many, maps just appear, devoid of context. Sure, people may like them but a general audience will unlikely not care one bit about the people who made them and the work that went into them. For instance, we learn of the incredible lengths that Bradford and Barbara Washburn went to create their utterly stupendous 1978 map of the Heart of Grand Canyon. Eight years of planning, fieldwork, analysis, drafting, painting and negotiating to create one map. Every trail in the canyon surveyed several times by multiple people using a measuring wheel to check and check accuracy again and again. Assistants were sent to check Bradford Washburn’s own measurements with strict instructions “if you make a bad mistake, never back up, as the wheel won’t reverse. Just stop and cuss a reasonable amount. Then go back to where you know you made your last reliable measurement.” Even the map’s main relief artist, the inimitable Tibor Toth reckoned he spent 1,074.5 hours to paint the map. I love these stories. They show the very human nature of cartography and the fact that everything on a map is somehow touched by a human whether it’s in data collection, decision-making, design or production. Every mark has the impact of the maker and the craft of their expertise and this book is at pains to reflect that in each piece of writing that accompanies the maps. As any good reporter will know, the story isn’t about them but it’s about what they are reporting and while there’s clear evidence of Mason and Miller’s love of the subject and the maps they write about, they have gone to great lengths to interview cartographers, curators and scholars linked to the maps and who can provide authoritative knowledge and insight. They’ve gone to the best and, so we are often treated to critique and comment from some of todays most experienced and respected cartographers and map experts. This brings a whole new level of character to the writing because we’re not merely reading descriptions, we’re reading a reflective piece that draws many pieces of information and views together. They’ve marshalled their interviews into consistent reportage as if they are simply the eyewitnesses to the stories. They write in an accessible and engaging style for a general audience. While there’s plenty to delight the knowledgable cartographic expert, the book will also reach a wider audience merely interested in some of the stories which they can access without having to interpret cartojargon. 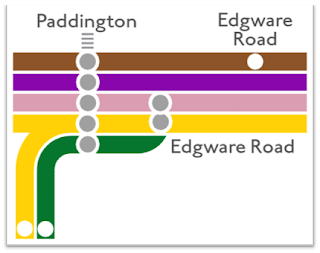 The layout of the book is also appealing with a loose structure combining maps and text as appropriate. Each illustration is provided with a detailed description so you’re guided through each entry by the main text and the annotations. 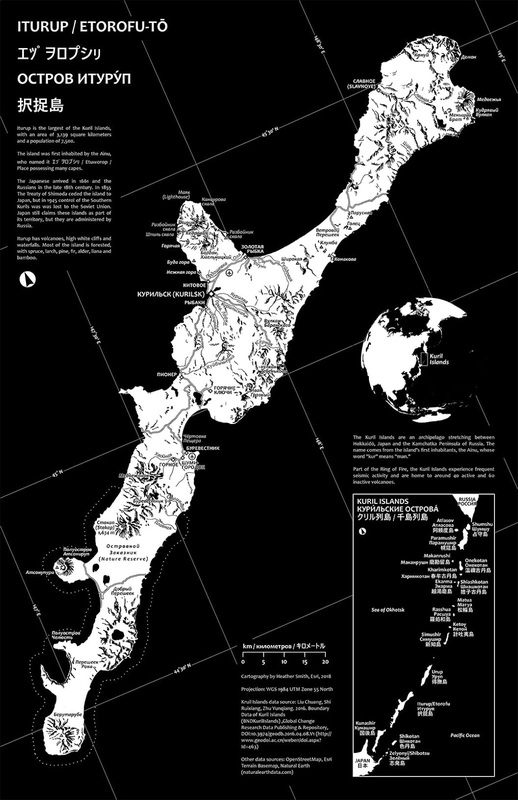 There are around 300 illustrations in the book and it’s hard to provide a definitive list of the type of content but there’s maps (obviously), diagrams, photographs, postcards, illustrations, paintings, posters, globes, atlases, examples of work under construction and so much else that helps paint a picture of the context of the maps. For instance, how many have seen the magnificent world ocean floor map by Austrian artist Heinrich Berann? Plenty. But the six pages devoted to this map includes photographs of the map’s scientific authors Marie Tharp and Bruce Heezen hard at work plotting soundings, transect profiles of the Atlantic Ocean, a wonderful physiographic diagram of the Atlantic drawn by Tharp herself which demonstrates the plan oblique approach then painted by Berann. Together the illustrations help tell the story of the famous map. There’s a nod to the work of Minard though with a focus on some of his less famous but equally wonderful statistical thematic cartography. And there’s even one of my colleague John Nelson’s maps: his lights on/lights out map showing the changes in nighttime illumination between 2012-2016. This fact alone demonstrates the efforts Mason and Miller have gone to in order to represent the full gamut of cartography which is no mean feat in 320 pages. Since the book is organized thematically there isn’t the usual old to new flow either. We see historic examples intermingled with contemporary and vice versa. It works well and you can pretty much just flick open a page and dive straight in. No, lose yourself just exploring and saying to yourself, oh go on then…just one more page. It'd be pretty difficult to review the breadth of maps in the book to give you a flavor even. Let’s just say Mason and Miller have got you covered whatever your map vice is. So whether you like the painstaking detail of beautiful topographic maps, the imagination of celestial charts, the analytical representation of statistical data or the fantasy of the map of Westeros or the Death Star then there’s plenty in this book to feast on. 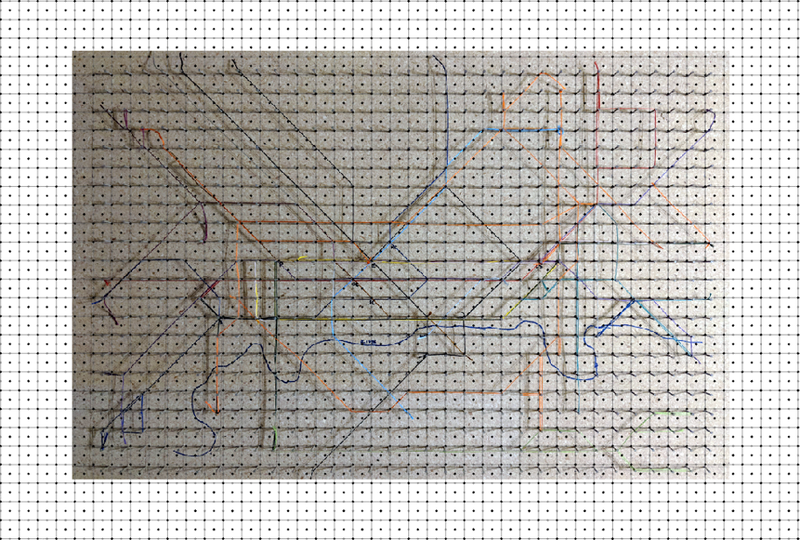 Hand-drawn, pixel pushed, sewn or plotted from the smell of a place, I’m struggling to think of a phase of cartographic history, design aesthetic or production method that isn’t covered somewhere in the book. That’s quite some achievement and it makes this a really comprehensive compilation that reflects the rich variety of cartographic work. I’d like to say that the book is a bit U.S. centric but it isn’t really and anyway, who would care if it is? 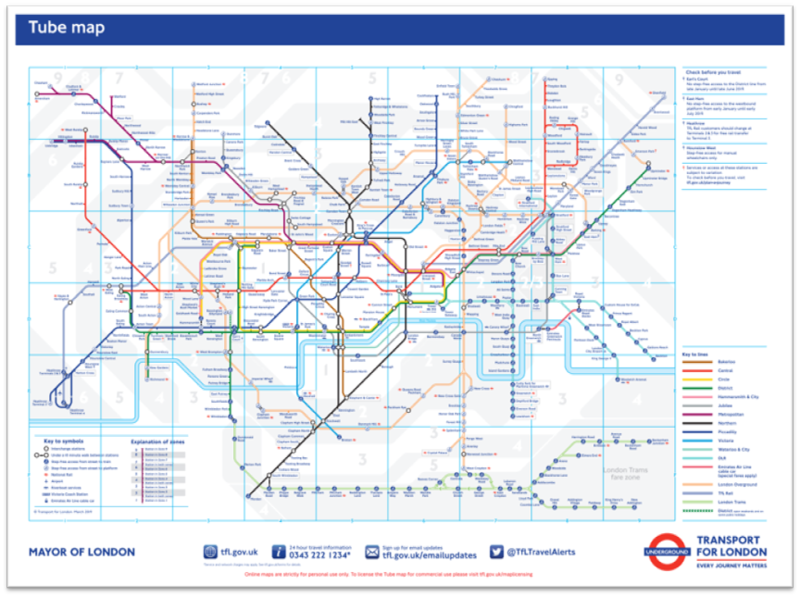 I mean, London A-Z is well represented just as much as Soviet maps of Washington D.C. There’s plenty of great maps of the US but there’s maps of pretty much every part of the world as well. So they’ve even made a book that covers the world geographically too. I’ve worked with Betsy and Greg on a few of their projects over the last few years and come to know them as hard working, meticulous and honest people. Reporters often get a bad name for being a bit lackadaisical and missing those crucial details that the experts of the content sweat over. But that’s not my experience with these two passionate reporters who want to find and deliver quality in their work. They have a knack of finding a story and what they bring to this book is a new perspective on the maps they’ve chosen. Even familiar maps are given fresh life and their style gives a modern take on the process and practice of cartography and the maps we make. I guess my only real surprise, rather than a criticism, is that the book wasn’t subtitled ‘Volume 1’ because I, for one, hope that they are already delving through National Geographic’s archives as well as the wider world of cartography to bring us a second collection at the very least. Maybe next time I’ll get a map in because that’d be a huge privilege and it’s possibly the biggest acclaim I can give to the book that I’m jealous that I haven’t yet made anything worthy enough to be considered. That makes me want to try harder as I hope for the next installment of their cartographic odyssey. Full disclosure: I received a free copy of the book for review from the publisher though there was no requirement to write a review, positive, negative or indifferent. I also acted as an advisor to the book albeit I can’t recall precisely what and am sure it was a miniscule contribution, a fleetingly brief conversation and pretty much irrelevant to the final product anyway. But you’ll find my name in the acknowledgments so it’s best to mention this.